Looking after your feet post-workout is vital for keeping them, and you, healthy and in shape. 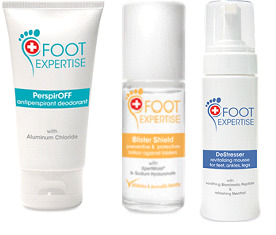 The Foot Expertise range, with it’s unique XpertMoist® formula, is the perfect solution to the most common and complex of foot ailments associated with exercise, with products ranging from a blister-protecting lotion to a swelling-reducing mousse. PerspirOFF: RRP 75ml £11.99 Sweaty feet, whilst the sign of a great workout, its not the most of pleasant of feelings the next day as you slip on those still-damp trainers. PerspirOFF is a effective medicated cream that has been specifically designed to fight off just that; high perspiration and bad odour formation. Not only containing antiperspirant agents, but anti-bacterial and antifungal properties as well, PerspirOFF is ideal for those who spend time at the gym, in the swimming pool or sauna as well as for everyday use. Simply apply a thin layer of cream to clean, dry feet before bed to achieve the best results. Use PerspirOFF every night for the first week until the desired level of perspiration control is reached. Then, lower use to 2-3 times per week. Do not apply to injured skin. Blister Shield: RRP 30ml £11.99 Compact yet powerful, Blister Shield is quick to react and provides instant blister relief. This lotion has been expertly designed to reduce friction and rubbing whilst preventing the formation of blisters on both feet and hands. If you are suffering from discomfort after running, weight-lifting, rowing or just general exercise, this practical roll-on applicator is conveniently sized to be carried in your bag for emergency use when you’re on the move. To use, gently dispense this lotion evenly onto the skin whenever burning, redness or throbbing sensations occur. Apply once or twice daily, as required, until the affected area is treated and returns to normal. Enjoy healthy, exercise-ready feet this summer! DeStresser: RRP 150ml £12.99 After your work out, its important to head home and relieve those feelings of weariness and stress on your legs, ankles and feet. DeStresser is a refreshing and revitalising mousse formulated for that purpose. This luxurious foamy lotion calms and hydrates the skin whilst moisturising without clogging up pores, providing enduring results that leave your skin feeling silky smooth, destressed and refreshed. Use DeStresser by gently massaging this lotion upwards onto your feet, ankles and legs until fully absorbed. Apply daily or whenever the need for lightness and relief is felt. The menthol ice-freshness effect will provide you with a long-lasting feeling of regeneration. These products are just some of the Foot Expertise range, that has been formulated exclusively for the health and well-being of feet and legs. With three specialist collections within the range; ‘Hygiene and Wellness’, ‘Prevention, Protection and Soothing’ and ‘Specials’, Foot Expertise delivers results from everyday care to the treatment of common and specific issues.